Hello Doodlebugs! 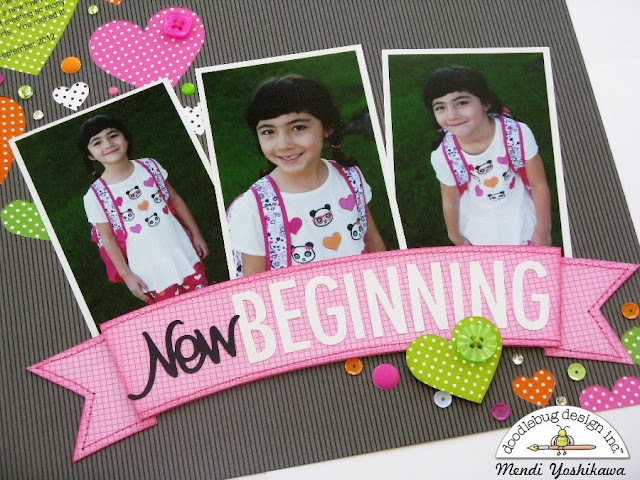 It's Mendi here today with a layout using all the beautiful new Swiss Dot Petite Prints. I wanted to find a way to use this wonderful new basic to create my own custom color scheme and I've had these photos of my daughter that I've never been able to find just the right papers for. By pairing the swiss dot papers with some of Doodlebug's other great basics I was able to achieve the look I was after. I decided it would be fun to have the heart cascade across the background to match the hearts in my daughter's shirt so I used my Silhouette Cameo to cut them out on my 12x12 background and then back them with the papers. To ground my title I cut out a large over-sized banner and the word "new" on my Silhouette to pair with Doodlebug's Skinny alphabet cardstock stickers. I then stitched around the two layers and sandwiched foam tape between them to create extra depth. I hope I've inspired you to create a custom color scheme of your own using these yummy swiss dot papers that come in a rainbow of colors! I love the vibrant combination of pink, lime and orange. Beautiful LO! This is so pretty Mendi! I love all the bling, hearts and sprinkles. I love those hearts, this is fabulous Mendi! Love your layout, love this paper! Thank you for sharing! Fun and playful - great layout Mendi! 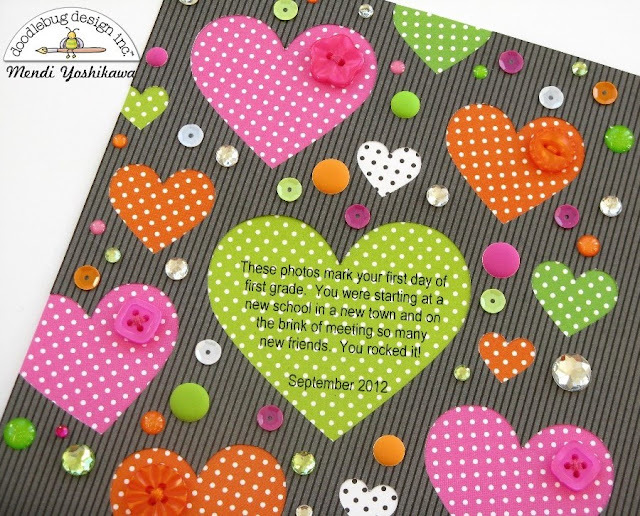 Such a fun layout and great use of the sweet buttons.